This component uses the SAP NetWeaver API to retrieve data and load it into a table. This stages the data, so the table is reloaded each time. You may then use transformations to enrich and manage the data in permanent tables. Note: Use of the SAP NetWeaver Query component requires an additional "JCo" connection library (libsapjco3.so) along with the java wrapper (sapjco3.jar). Log in to the SAP Service Marketplace and access the SAP JCo download software from http://service.sap.com/connectors. If necessary, select the Tools & Services page to display the download page. Download the most recent version of the SAP JCo 3.x for linux. Then, copy the files to the Matillion ETL for instance in the following location, and restart tomcat. Without these additional files, you may get errors such as: "SAP JCo library not found: verify the correct jar file is present.". With an incorrect password, or other authentication problem, you may get errors such as: "Initialization of repository destination INERP_JCO_DESTIANTION_NAME3 failed". The component offers both a Basic and Advanced mode (see below) for generating the SAP NetWeaver API query. Note that, although this is exposed in an SQL-like language, the exact semantics can be surprising - for example filtering on a column can return more data tha not filtering on it, an impossible scenario with regular SQL. Note: The data model only lists a few of the many SAP tables. You may need to add new data sources as described in this article. Basic/Advanced Mode Choice Basic - This mode will build a SAP NetWeaver Query for you using settings from Data Source, Data Selection and Data Source Filter parameters. In most cases, this will be sufficient. Advanced - This mode will require you to write an SQL-like query which is translated into one or more SAP NetWeaver API calls. The available fields and their descriptions are documented in the data model. Host Text The hostname or IP of the SAP NetWeaver server. Username Text A valid SAP NetWeaver username. Password Text A valid SAP NetWeaver password. Users have the option to store their password inside the component but we highly recommend using the Password Manager option. Client Text The client authenticating to the SAP system. Comparator Note: Not all comparators will work with all possible data sources. Choose one of Equal To, Greater than, Less than, Greater than or equal to, Less than or equal to or Like. Limit Number Fetching a large number of results from SAP NetWeaver will use multiple API calls. These calls are rate-limited by the provider, so fetching a very large number may result in errors. Most options are usually not required as sensible defaults are assumed. However, the SAP NetWeaver it may be necessary to set additional connection options, e.g. "stsurl". 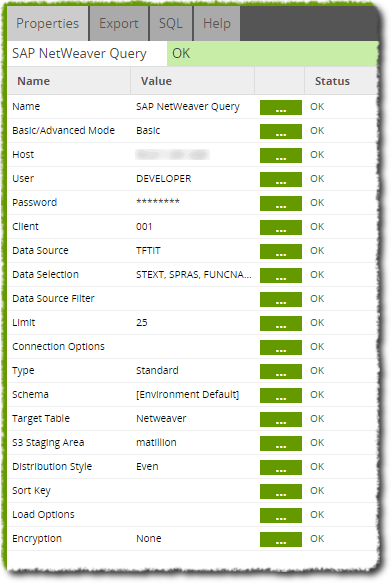 Connect to the SAP NetWeaver service and issue the one or more API calls. 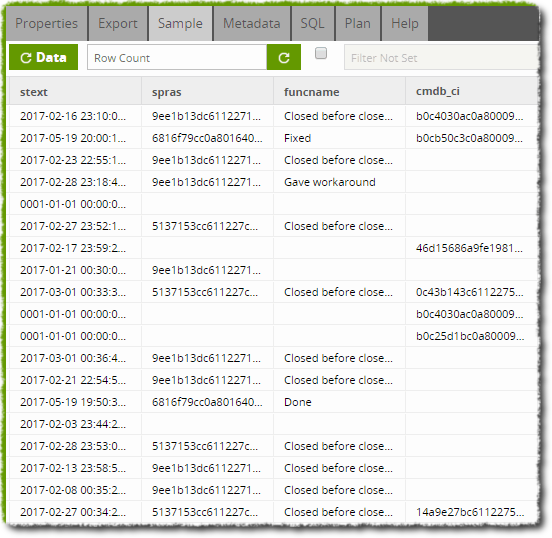 Stream the results into objects on S3, recreate or truncate the target table as necessary and then use a COPY command to load the S3 objects into the table. Finally, clean up the temporary S3 objects. In this example we load in some data using the SAP NetWeaver Query component. The job we will use, shown below, creates a table which is then used to load data into. The properties for the SAP NetWeaver Query component are shown below. An IP address for our server is entered into the 'Host' property and a username and password that can access this server are also entered. After choosing a data source and including some columns into the data selection, other options can be left default (usually blank) and the component will intelligently use correct options. This job can now be run in its entirity. If wanting to run this multiple times without cleaning the table up, it is advised to switch the Create/Replace Table component to 'Replace' mode. With the job run, this data is loaded into a table. The output can be checked by creating to a Transformation job and loading the table using a Table Input component. Checking the 'Sample' tab will sample the data in the table.